Give the gift of Classic Style! With its distinctive dial and all-black NATO strap, the Classic Black Cornwall is a true eye-catcher that embodies the timeless and elegant characteristics of Daniel Wellington's flagship Classic collection. With a sleek design and a captivating essence, this is a modern Classic made for every occasion and the perfect Holiday Gift for the stylish Man! Give Him a Stylish Gift! Give him a sleek and stylish edge with the modern design of the Armitron Mens Black Bracelet Watch-20/5165BKTI. The watch features day & date subdials in 12/24-hour formats. The watch is the perfect gift for the man that has everything. ​Give Him Eau de Success! Lyon's Legacy is a sophisticated masculine scent that is associated with Fox's hit show Empire and is this Holiday's fragrance must-have! The scent opens with a sparking blend of bergamont and lemon water, leading to an aromatic heart of lavender buds, crisp geraniumm, and clary sage, with a drydown enriched with dark & mysterious notes of warm amber, vanilla suede and tobacco leaf. This is the perfect gift for a Man that is a fan of the hit show or wants a new intoxicating scent! Buy Him a gift of Choice! Give him a gift that allows him to test out four different fragrances before choosing a favorite scent in a larger size! Abbott Home Try-On Kit includes four vials to test out the four unique scents: The Cape, Sequoia, Mojave and Telluride. 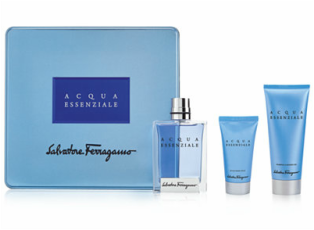 Salvatore Ferragamo celebrates the Holiday with this luxurious 3-piece Acqua Essenziale set for a deeply fresh and elegant masculine statement. The gift set includes Cologne, Aftershave Balm, Shampoo and Shower Gel. The set makes the perfect gift for the man that has everything! Let the force be with him with a Star Wars surprise! Made from high-quality ceramic and topped with a pewter-hinged lid, the 32 oz. Star Wars Stein is shaped in the likeness of R2D2 from the iconic Star Wars movie series! No stranger to serving drinks, R2-D2 keeps drinks on stable footing with his two flat feet and keeps any guy happy for the Holidays! Buy a gift that he will LOVE! For the Man in your life that loves Comics, he will LOVE Marvel Comics 2-piece Set of 16 oz. Glass Tumblers! He will fantasize about being a superhero while enjoying a pint of beer! ​Buy a gift that he will TOAST to! ​The Stormtrooper Toaster is a gift that any Star Wars fan will love! The toaster confirms one’s unwavering loyalty to the Galactic Empire with slices of bread indelibly browned with the Imperial Crest. Shaped in the form of the ubiquitous stormtrooper’s helmet, the toaster simultaneously serves as a literal example and metaphorical icon of Imperial imprinting, yielding identically marked split buns, muffins, and waffles with an obediant fervor that never questions authority. The toaster features a light/dark selection knob to deliver to your satisfaction and a removable crumb tray to ensure a mess-free environment. Buy a gift that he will Chill with! Any Man that loves Whiskey will appreciate the ​Balls of Steel Whiskey Chillers. The two-piece set are unique whiskey chillers with a cause. They shift your drink down to a more desirable temperature and maintain the delicate flavor balance of whiskey and other robust spirits. 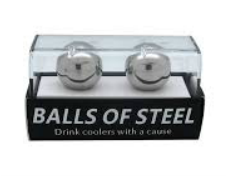 Using Balls of Steel whiskey coolers provides boosted flavors, creates a truly unique experience and a gift he will never forget. Give the gift of Star Wars! For any Star Wars fan, the ​Star Wars "Being Darth Vader" Adult Comfy Throw is the PERFECT Gift! He can suit up as Darth Vader in this Star Wars Adult Comfy Throw by The Northwest Company! Decorated with your favorite sci-fi character, this blanket with sleeves is not only colorful and vibrant, but also soft and warm! Made of soft, luxurious fleece with oversized loose-fitting sleeves, the Comfy Throw lets your upper body remain protected from the cold while leaving arms and hands free to use a laptop, TV remote, read a book, eat a snack, enjoy an outdoor sports event and much more! Buy a gift that he will Lounge in! The Lands' End broadcloth PJ shirt has a classic fit with extra comfort! The fabric is silky soft because Lands' End uses tightly woven broadcloth in 100% cotton. Features include a chest pocket, handy hanger loop in back, clean-finished back neck seam, and secure cross-stitched buttons. This is a gift he will surely love! ​Buy a gift that he will Lounge in! The ​Lands' End Classic Fit Broadcloth Pajama Pants are a silky-soft way to dress for bed. They feature a classic fit which means extra comfort! The fabric is silky soft because Lands' End uses tightly woven broadcloth in 100% cotton. The pajama pants include an easy-moving elasticized waistband, one-button fly and two onseam side pockets. This is a gift he will surely love! ​​Buy a gift that he will look great in! He can transition between uphill ascents and downhill burners in this high performance 1/2 zip. The top features full four way stretch fabrics that allow for easy movement and versatile usage. Equipped with an oversized chest pocket for storage and reflective detailing for added safety, this top is perfect for a Man that loves to ski! Give HIM the gift of COMFORT! Give him a cold-weather classic in chill-defying yarns of wool/acrylic/nylon. The Eddie Bauer Interlodge Pullover Sweater is built for years of comfort! This is surely a gift he will not want to take off! Give HIM the gift of WARMTH! 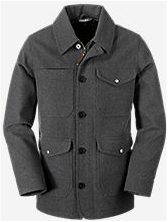 An Eddie Bauer classic is updated with a modern fit. From chopping wood for winter to a night on the town, this windproof wool/synthetic blend Mackinaw keeps you warm when temperatures dip. A tall collar can be popped and the button storm flap over the zipper secured to shield against icy blasts. Give HIM the gift of Traction! The Hush Puppies Action Parkview Ice Boots are both waterproof and leather and the perfect pair for winter. The Thermochromatic lug changes color to indicate when the temperature reaches freezing. The boots also feature Vibram Arctic Grip rubber outsoles that are designed to keep him on his feet even on slippery, wet ice! They are perfect for a man that loves looking stylish on an adventure! ​​Give the gift of Personalization! Feetz are for anyone that wants the perfect fit in a shoe and make the perfect personalized gift! Shoes are custom made using a 3D printer based on your specificed measurements, color preference and syle preference then shipped directly to you! They feature soft black antimicrobial microfiber lining, arch support and extra cushioning for the most comfortable fit! These custom made shoes will change the way you look at shoes forever! Give HIM the gift of HEAT! The ThermaCELL® ProFLEX Heavy Duty Heated Insoles is the next generation of foot warming comfort! These revolutionary insoles provide warmth at the touch of a button-- from your smartphone via Bluetooth! With extended battery life, fast charging capabilities and rugged durability - this product can take on the most extreme environments. Two removable cushioned batteries will charge in two hours or less and provides up to 8.5 hours of warmth. The insoles are customizable and fit men's shoe sizes 3.5-13. This is a a high-tech gift he will LOVE! Give HIM the gift of Organization! Enhance his outdoor experience by giving him the Gobi Gear SegSac 15L to pack smarter! With 4 internal compartments to organize gear, this clever stuff sack ensures he will find what he needs on the first try! Place it inside a backpack or luggage for the next adventure. The SegSac is made of ultralight, 30D Cordura-brand nylon fabric and makes a great gift! Give a gift that he will CHERISH! Are you looking for a gift that surprises, delights and moves your loved one to tears? AwesomeBox is an entirely new way to give a truly memorable surprise gift that he will cherish forever! Easily curate personal memories, stories and photos of your loved ones, and package them into an eye-catching one-of-a-kind gift that will have them smiling, crying and laughing! You can also invite friends to help you create the AwesomeBox for your loved one by having them share pictures or messages. Once you have uploaded your pictures (you select the number of cards) and messages online the cards and memory box is created and mailed directly to the recipient! So show your loved one how "awesome" they are with an AwesomeBox this holiday! Give him the gift of Batman! Give a gift that EXCITES with Batman! Let him recreate Gotham City with his own 4D Puzzle! He can explore the geography of one of fiction's most famous cities! The puzzle comes complete with 1550+ puzzle pieces and 160+ detailed buildings. Assembling the two layers of the puzzle forms a map of the city's streets, islands, roads, railways, parks, and geography! It's the perfect gift that will keep him entertained! Give him the gift of Game of Thrones! Is your loved one a Game of Thrones fan? If so give him a gift that will entertain him for hours with the 4D Cityscape Game of Thrones Puzzle which is based on the award winning HBO television series. This puzzle will guide players through the assembly of the map of Westeros in a patented multi-layer design. The first layer is a 1000+ pieces jigsaw puzzle that will teach you all about the various locations and regions of Westeros. The second layer is an artistic 200+ pieces jigsaw puzzle that replicates the current landscape based on the famous introduction of the television series. The third layer adds the 3D miniature replicas models that you insert into the puzzle, which include famous cities and castles such as Kings Landing, Winterfell, Eyrie, the Wall, and more! This is the perfect gift for the guy that has it all! Give him the gift of monthly SURPRISES! 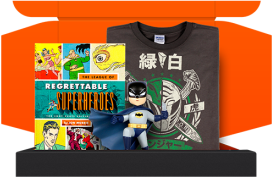 Loot Crate is a monthly subscription service for geeks, pop culture lovers and gamers! The Loot Crate is a curated box that is mailed every month with collectibles, apparel, gadgets, art and other epic gear from the hottest entertainment and consumer product companies in the world, including Star Wars, Disney, Marvel, DC, Star Trek, Nintendo, Hasbro, Mattel and many more! The box contains items that are valued at $45+ and can be purchased individually or as a subscription. This definitely makes a great gift for the Man who has everything!